You can search for music using keyword search. The keyword search enables you to find the music you want by matching the keyword and returning all matches where the keyword is present in the track name, singer name or album name. The keyword search also provides auto-complete suggestions for the keyword(s) as you are typing so that you can select one of them if that is the keyword or the keyword phrase you are looking for. Additionally, Media Drug saves all your searches using the tab system so that you can access your previous searches anytime by clicking on the appropriate tab and access the playlists or create new playlists associated with the search. The keyword search feature of Media Drug allows you search for music by using keywords. The keyword will be matched with album names, singer names, album names, etc and return matching mp3s with the specified keyword(s). Enter the keyword to search by in the search field. As you start entering the keyword, a list of suggestions for the keyword will be displayed. Select a suggestion if it is what you are looking for. Otherwise, just continue entering your keywords. Once you enter or pick a keyword, click on the "Search" button to search for mp3s matching the keyword. 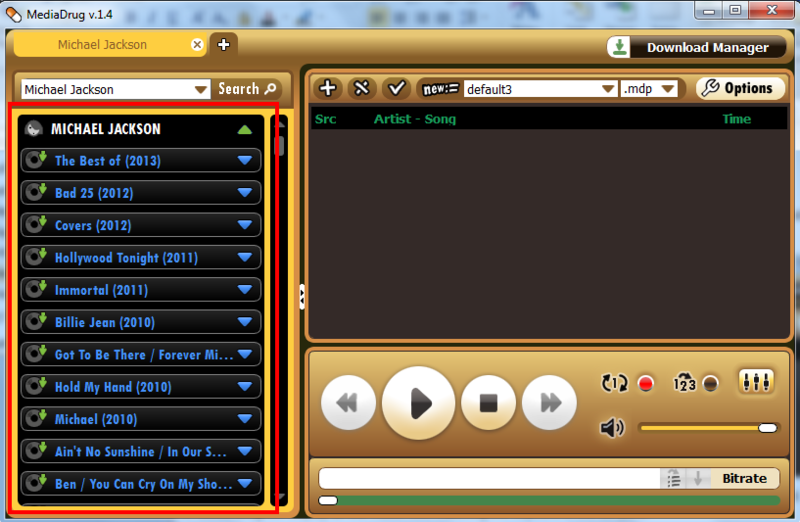 Media Drug will display all the music files matching the keyword in the left pane. Media Drug will display all mp3s that contain the keyword entered in the track title, album title, and singer. Media Drug enables you to search for and retain multiple searchers using the tab system. The tab system is similar to the one on your browsers. 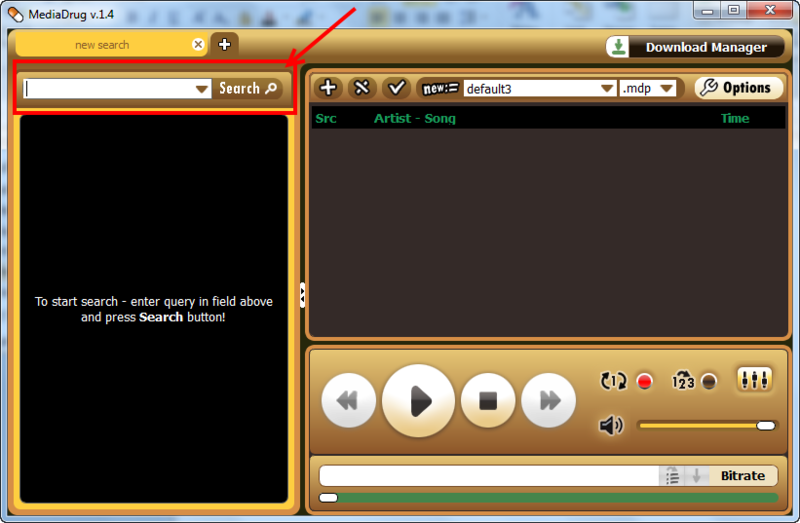 A new tab will be displayed with the search pane and all other windows in Media Drug. Use the new tab to create a new search or create a playlist. You can create as many searches as you want and have easy access to them using the tabs. The tab system in Media Drug allows you to retain multiple searches and create playlists from them. You can search for different artists, keywords, song titles from different tabs and then go back to them as needs. All your searches will be retained in its own tab. Just click on the appropriate tab to view the results for that search.